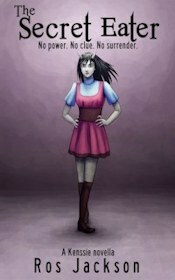 Castle Waiting is a strange fairy tale, even in a genre where weirdness is the norm. It's a graphic novel suitable for middle grade readers, but it will also appeal to much older readers, thanks to the way it subverts expectations. The story begins with a retelling of Sleeping Beauty, and other than the addition of a cheeky frog and a tiny demon called Leeds, it seems like a conventional retelling. But it turns out that this is only an introduction, and the rest of the story takes place long after the castle's inhabitants have awoken from their magical sleep. It has become a refuge for people in need, run by Rackham, a man with the face of a heron. One of those refugees is Jain, a pregnant woman who has trekked across the country to escape an abusive husband. This tale is set in a medieval world that's kind of our own but mostly not. So there are references to Toledo and Jesus, but there are also people walking around with animal heads, and other fairytale creatures in abundance. The castle is infested with pixies. However, the real magic comes when the inhabitants get together to tell their stories. Sometimes they're dramatic, but more often they have an everyday kind of humour and an endearing quirkiness. We get to know about Henry, who hardly seems able to talk to anyone, and we meet the confident horse-headed Sir Chess. There's the fun-loving Sister Peace, a very strange doctor who always wears a mask, a lecherous water sprite, and many more. Most of all there are lots and lots of beards, usually on women. Everyone in this world seems to be peculiar in one way or another. The interior artwork is all black and white, but it's good. It's clear who is who and what is happening, and it's of a consistent quality. Linda Medley really does seem to have a penchant for drawing women with beards, though. Castle Waiting is full of stories of acceptance and the struggles of people who are different. The tales are sweet, but they're also too amusing and bizarre for the happily-ever-afters to come across as saccharine. So it glows with warm fuzzy feelings, and the characters are so engaging that it gets more engrossing as it goes on. They're the kind of characters whose antics would be fascinating even if they weren't doing anything other than the laundry. In a town where supernatural creatures live beside ordinary humans, a werewolf barista tries to blend in. But when her friend is hurt by a rogue magician she has to take a stand. The first in the Moonstruck series. When Ali Baba finds two Sleeping Beauties, he has no idea which one he should wake with a kiss. 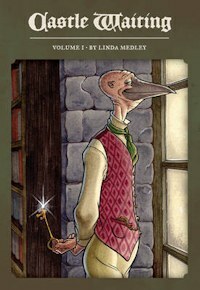 A graphic novel featuring the characters from Fables.